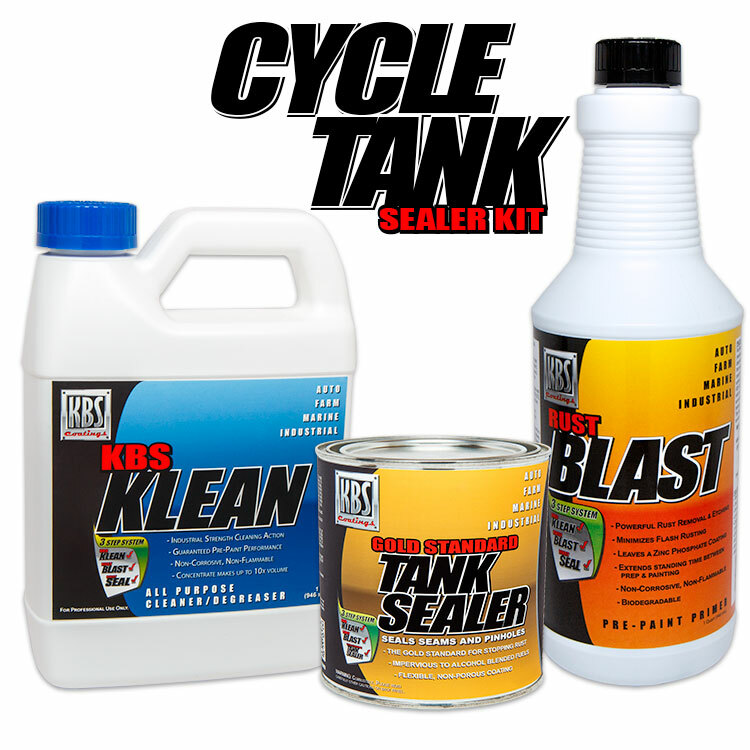 The KBS Cycle Tank Sealer Kit contains everything you need to seal a tank of up to 5 gallons. 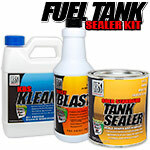 This kit contains our KBS KBS Klean (a water-based, heavy-duty, cleaner/degreaser) and KBS RustBlast (a powerful rust remover/metal etch) to obtain a permanently sealed, rust-free fuel tank. These KBS prep products are formulated to extend rust-free storage times by leaving a temporary protective coating in addition to a zinc phosphate film. I purchased this after speaking with a lot of friends who restore bikes and hearring rather disappointing reviews from them about some of the other products they tried so I took the plunge and tried something new. I will never go back to any other liner, I was able to reseal a tank for Yamaha Vision that had been sitting out and has numerous pinhole leaks. I patched the outside and then used KBSs coating to seal the tank and it's held up amazingly well, I couldn't believe how clean I was able to get the tank with their product before I coated it and now with the coating in it's like new tank. 10/10 will definitely be ordering this again for a restoration project. I lined a CB550 tank with this product over the winter and couldn't be happier. This product covers well and the pre cleaners work very well. I did use a toilet bowl cleaner first just to get the large chunks out before switching to the kit cleaners. This is the second tank I have used this product on and the first was done in 2011. It has held up perfectly. This is the second bike I have used a KBS kit on. I like them as they are easy to use and provide great results I have tried other brands and was not happy with the end result so it is KBS from now on. This worked well. I let it set up longer than the time recommended due to scheduling, I was also able to re-use the blast when I found some rust at the bottom seam. 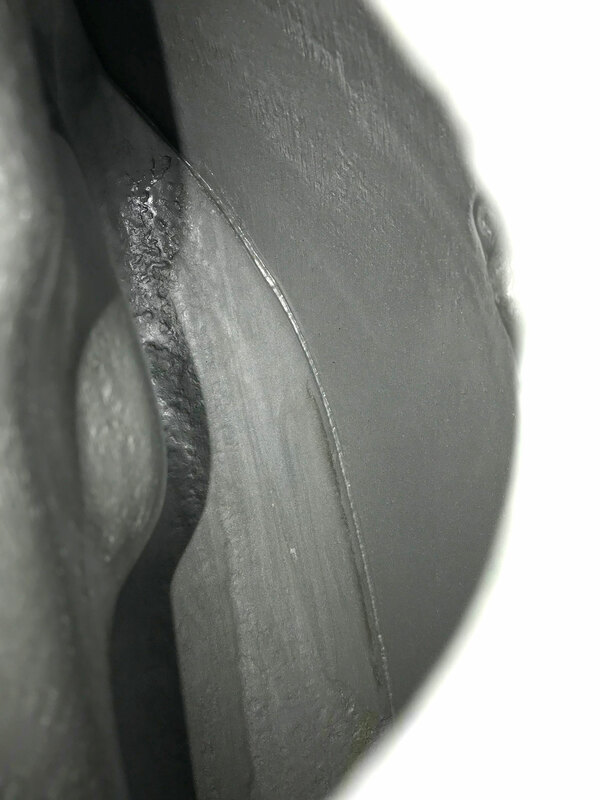 I have ridden 50 plus miles of mountain and dirt roads and now not getting the carb plugs I was getting previosly. Worked just as described. We watched the video before cleaning the tanks. They turned out wonderful. Thank you for a great product at a reasonable price. Very easy to use seemed to coat well great product. Easy to use. Worked as described. I used it on a stock painted tank, with caution, and didn’t wreck the paint. Would definitely recommend and use again if needed. Great product and very fair price. Had an old kawasaki big horn tank that was sitting for 35 yrs with old fuel in it. With 3 nights of work and patience KBS products fully restored my tank. With limited labor and hours the products they offer are effortless and effective. I would recommend this product to anyone! 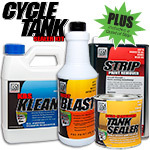 Q: I want to order the basic cycle tank repair/sealer kit, but i'm being asked if I want the Mesh too. What's the mesh for ? A: The Fiberglass Mesh can be used to seal up and reinforce a weak area or an area with several pin holes. This is done on the outside of the tank with some of the Tank Sealer used as the "resin" for the Mesh. Was this answer helpful? 42 of 46 Customer(s) found this Answer helpful. Q: Is there a min. temp to use this? A: It is always best to do all three steps (KBS Klean, RustBlast, Tank Sealer) when the ambient and surface temperature is above 55 degrees. Was this answer helpful? 29 of 33 Customer(s) found this Answer helpful. A: Yes, you can do (2) tanks with (1) kit. Be sure to prep both tanks and then pour 1/2 of the can of Tank Sealer into one tank and then the other 1/2 of the can of Tank Sealer into the other tank immediately. Note: Never pour the Tank Sealer from one tank to the next. Q: I bought a new gas tank for my Harley. the manufacturer say's to pressure test it before use. where do I get that done? is it expensive ? A: Please call your local radiator shop as this is where many of our customers get pressure testing done. Q: Have used your tank sealer before, worked great. 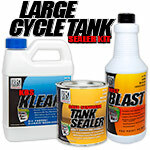 Is your sealer OK for use in a motorcycle oil tank? This is an old Harley and the tank does not get any return hot oil. 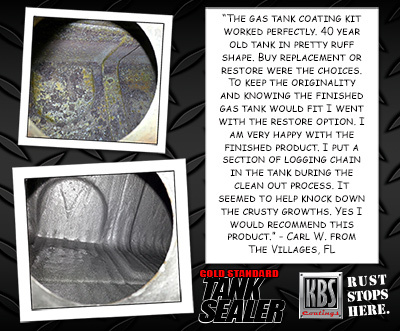 A: Yes, our Tank Sealer can be used to seal up an oil tank after the tank has been prepped using KBS Klean and RustBlast.